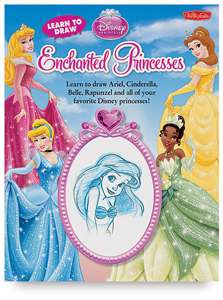 Whether she comes from a faraway land, a delightful castle, an enchanted wood, or under the sea, each princess featured in Learn to Draw Disney: Enchanted Princesses has her own special story about her journey to "happily ever after." Now kids can learn how to draw their favorite Disney princesses, including Snow White, Cinderella, Sleeping Beauty, Belle, Ariel, Jasmine, Mulan, Pocahontas, and Rapunzel, with this learn-to-draw book. Filled with easy-to-follow, step-by-step drawing instructions, and with each new step outlined in blue, this children's book will provide hours of artistic fun. Drawing tips and techniques from the Disney Storybook Artists teach kids how to draw these princesses just like they appear on the big screen.